Digital Inferno is the creative Identity of Shaun Preece, a freelance Graphic designer and illustrator from Swansea in South Wales UK. Shaun is a results driven individual that excels when faced with a challenge. Graphic design & Illustrative expertise mixed with cutting edge Marketing creativity & excellent people skills amalgamate into an all-round individual. Effective communicator with a proven ability to build strong, working relationships. Shaun has been freelancing for the past six years and has worked for an array of clients both UK and worldwide. Shaun Specializes in Creative branding, web design and advertising campaigns drawing inspiration from design greats such as Peter Jaworowski (The Hejz) and James white. Aside of his freelance work Shaun is also the co-founder and creator of the brand 'Design For Bands' http://www.designforbands.co.uk A UK creative agency that provides comprehensive creative solutions for bands, artists and the music industry. 'More than just a drink' project breakdown. A Key visual created to portray Coca Cola as an energising sof drink. 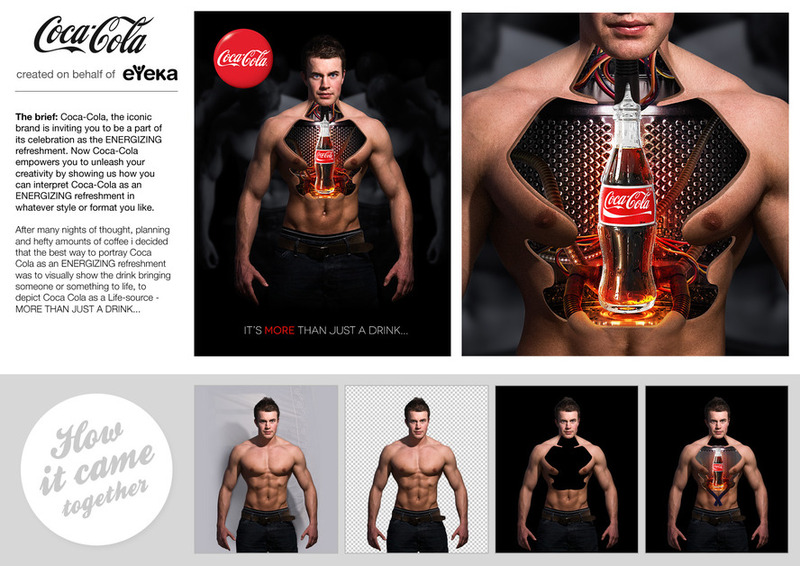 Created for Coca Cola on behalf of Eyeka Europe.